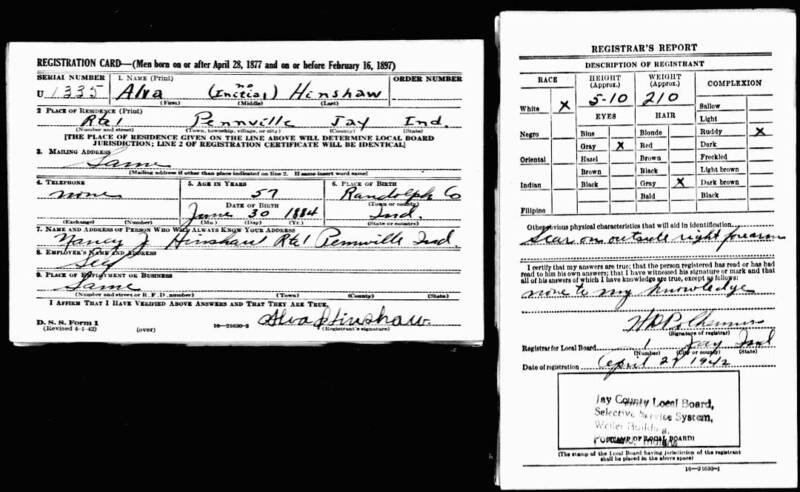 Hinshaw, Alva, head-of-household, age 25, born in Indiana; parents born in Indiana; first marriage, married 0 years; occupation: farmer, general farm; rented farm. Hinshaw, Bessie, wife, age 17, born in Indiana; parents born in Ohio; first marriage, married 0 years; no children. 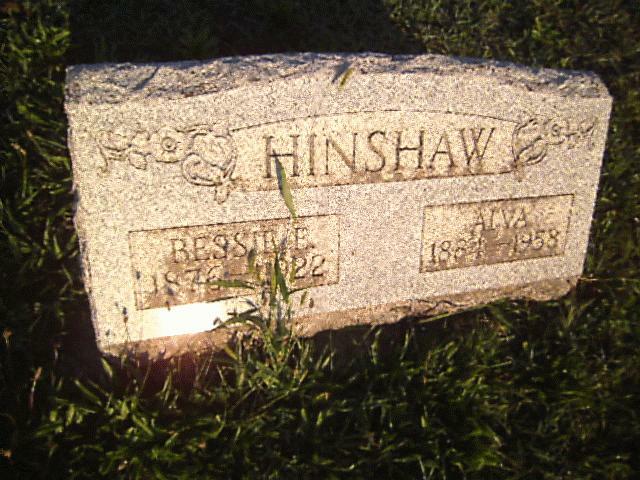 Hinshaw, Alva, head-of-household, age 36, born in Indiana; parents born in Indiana; rented home; occupation: farmer, general farm. Hinshaw, Bessie E., wife, age 27, born in Indiana; parents born in Ohio. Hinshaw, Dale E., son, age 8, born in Indiana; parents born in Indiana; attended school. Hinshaw, Gale W., son, age 6, born in Indiana; parents born in Indiana; attended school. 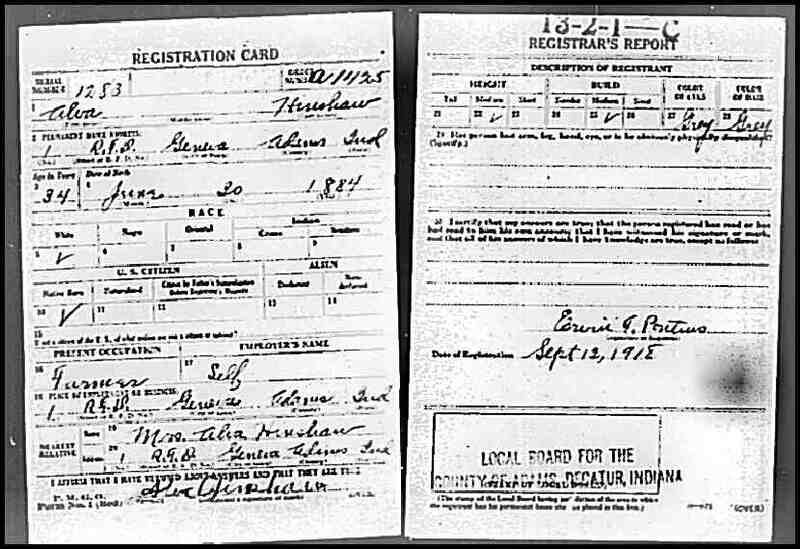 Hinshaw, Alva, head-of-household, age 45, born in Indiana; parents born in Indiana; first married at age 25; rented home; no radio in home; occupation: farmer, farming; not a veteran. Hinshaw, Nancy, wife, age 39, born in Indiana; father born in Ohio; mother born in Indiana; first married at age 21. Hinshaw, Dale, son, age 19, born in Indiana; parents born in Indiana; attended school. Hinshaw, Gale W., son, age 17, born in Indiana; parents born in Indiana; attended school. Ault, Ivan [unclear], stepson, age 9, born in Indiana; parents born in Indiana; attended school. 1920 census, Jefferson Township, Adams County, Indiana; roll T625-420, ED 4, page 6A, line #15, dwelling #107, family #115. 1930 census, Bearcreek Township, Jay County, Indiana; roll T626-595, ED 2, page 10A, line #2, dwelling #214, family #214. Indiana Works Progress Administration; book H-15, page 3. Indiana Works Progress Administration; book H-15, page 51. 1910 census, Jackson Township, Jay County, Indiana; roll T624-358, ED 63, page 3A, line #5, dwelling #46, family #46. Indiana Works Progress Administration, 1938; county book C-K, page 168. Ancestry Family Tree data "Rice GEDCOM FOR EXPORT 1 Jan 2012" posted by "atlaspc12". 1900 census, Liberty Township, Mercer County, Ohio; roll T623-1304, ED 85, page 9B, line #98, dwelling #180, family #185. 1920 census, Jefferson Township, Adams County, Indiana; roll T625-420, ED 4, page 7A-B, line #50, dwelling #139, family #146.